← October In Our Garden! Directions: 1. Melt butter in a Dutch oven over medium heat. Add onion, jalapeno pepper, and garlic; sauté 15 minutes. Add chicken broth and next 4 ingredients; cook, stirring often, 30 minutes or until potato is tender. Remove from heat, and let cool slightly (about 5 to 10 minutes). 2. Process potato mixture, pumpkin, and cilantro, in batches, in a food processor or blender until smooth, stopping to scrape down sides. 3. Return to Dutch oven; stir in milk, and simmer 10 minutes or until thoroughly heated. Stir in lime juice; garnish, if desired. Review your pumpkin facts here. 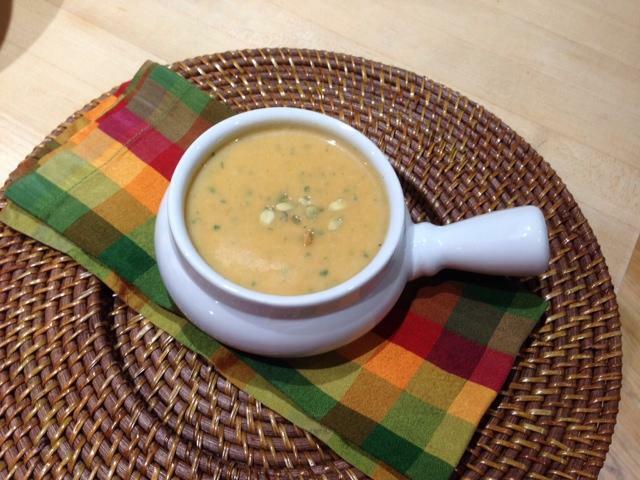 Posted in Fall, Recipe and tagged Dallas Farm to Table, garden recipe, pumpkin recipe. Bookmark the permalink.